I LOVE antiques. Maybe it’s because I love history and archaeology. Maybe it’s because I just want a connection with the past. Maybe it’s because I know my life is limited and I want a piece of immortality. Whatever the reason, I love antiques. I was on vacation last week (yes, that’ why I didn’t post, I was too busy lol) and did a bit of antique shopping. 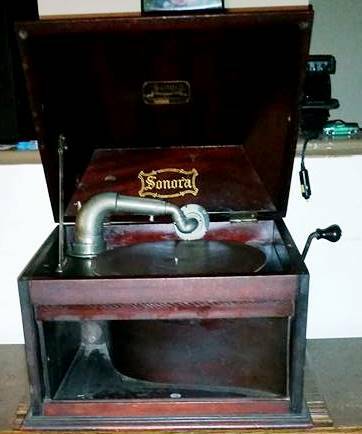 I found a beautiful Sonora phonograph. You should hear it! I’ll have to upload a video of the sound. It’s gorgeous. It cranks up like a dream. I just need to find the missing front doors on it (hoping I can find replacement ones) but I may install a little curtain in the front for now for sound control (one with no hardware). In case you are wondering, it is sitting on top of my antique singer sewing machine, it’s from about the 1880s, the phonograph from about 1910/15. This entry was posted in Geekery & Games, The Journey and tagged Antiques, history, new, old, past, Phonograph, Sonora. Bookmark the permalink.